(93 percent of 247 doctors) say their emergency departments are not “fully prepared” for patient surge capacity in the event of a natural or man-made disaster, or mass-casualty incident, with 49 percent saying they are “somewhat” prepared, according to the poll conducted by the American College of Emergency Physicians (ACEP). According to the poll, nearly 90 percent of responding emergency physicians report having to take time away from patient care to explore the viability of alternative treatments and medications. In addition, nearly 70 percent say that drug shortages have “increased a lot” in the past year. Increased coordination among public health and safety services, emergency medical services, medical facilities, trauma centers and other entities in a region. Tracking of pre-hospital and hospital resources, including inpatient bed capacity, emergency department capacity, trauma center capacity, on-call specialist coverage and ambulance diversion status with regional communications and hospital destination decisions. Consistent, region-wide prehospital, hospital and interfacility data management systems. “Congress must recognize that current shortages of essential emergency medications are a substantial threat to our nation’s preparedness and response capabilities. ACEP urges lawmakers to establish an inter-agency, inter-departmental, and multi-disciplinary task force that includes representation from the HHS Assistant Secretary for Preparedness and Response, the Food and Drug Administration, and the Drug Enforcement Administration, among others,” said Dr. Kivela. In addition, ACEP supports the inclusion in PAHPAI of legislation that makes military trauma teams available to civilian trauma centers, which would allow the teams to maintain their skills in between rotations to conflict areas, while providing much-needed additional trauma care personnel for treating injured civilian patients. 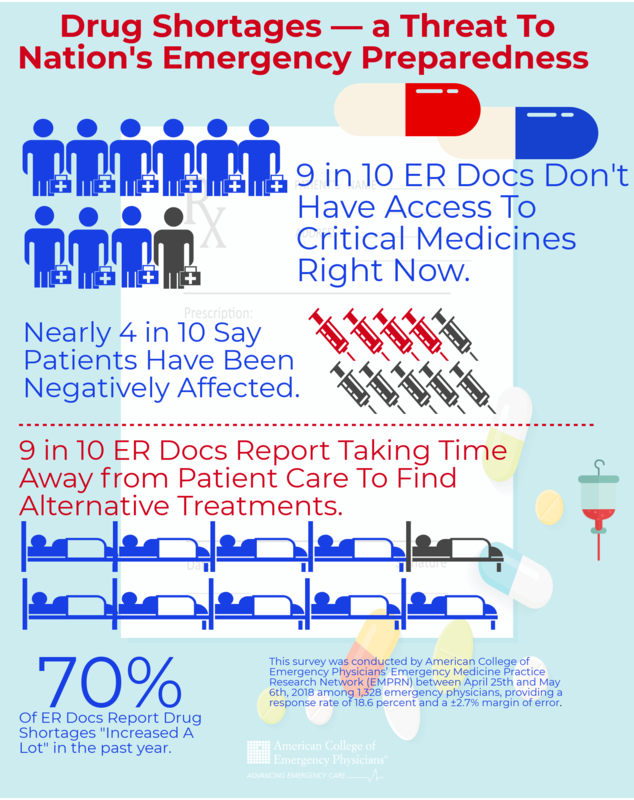 This survey was conducted by American College of Emergency Physicians’ Emergency Medicine Practice Research Network (EMPRN) between April 25th and May 6th, 2018 among 1,328 emergency physicians, providing a response rate of 18.6 percent and a ±2.7% margin of error. For complete poll results, please click here or contact Mike Baldyga at mbaldyga@acep.org.